Today is a sad day for the TechRadar office, and by extension the world. 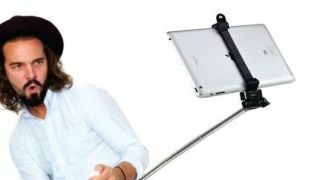 Someone has created an iPad selfie stick, rolling two terrible ideas - selfie sticks and people who take pictures with tablets - into one easy-to-hate device. For the narcissistic amongst us, you can now use your Apple tablet's front-facing camera to take photos from up to three feet away. Apparently it's allowed to use these in everyday situations too, not just posing with weapons, sitting at funerals or while rubbernecking at accident sites. We haven't had the joyous opportunity of trying one of these things out yet but we suspect you're going to be needing arms to rival Popeye just to hold an iPad up at that distance for more than a couple of seconds – especially if it isn't the ultra-light iPad Air 2. If you really want one, head over to Accessory Geeks. Just don't tell us if you do. We'd rather not know. Are you done with planet Earth now? Most of our blips will help you love the planet we love on, whilst some others won't.